Long dominated by execution performance metrics, the measurement of online ad effectiveness is shifting towards brand measures such as awareness, favourability or purchase intent, as advertisers seek to be more definitive about ROI. So which form of display ads deliver? Research from Millward Brown found that rich display and video ads can be up to four times more effective at building brand measures than other formats. When combined, the two formats can be even more powerful, boosting brand favourability by 4.7% and purchase intent by 4.3% in tests conducted. 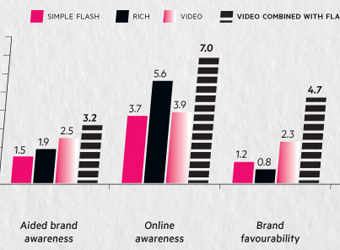 Video rated as the strongest stand-alone performer for three of the four brand metrics analysed, but for online ad awareness rich formats was the most effective generating a 5.6% uplift among the exposed group compared to the control group in the study. The frequency of exposure to display ads also plays an important role, with higher frequency not a positive thing in all cases, the study found. Video formats were found to be stronger performers at lower rather than higher frequencies, particularly for brand favourability and purchase intent measures. In fact, over-exposure to high impact formats can drive down attitudes toward a brand, particularly purchase intent. Read more about the most effective exposure frequency for different formats and more about the study here. A constant brand and message presence in the ads showed clear benefits, with awareness, favourability and purchase intent measures more than double for those with 100% logo presence over those with only partial presence. A similar trend was noted for ads with 100% message presence compared to partial message presence. The days of solely measuring online campaign success on a cost per click or lead-generation basis are fading, says director of Millward Brown’s media and digital solutions, Mark Henning, with these measures indicating engagement with the ad itself rather than its success in improving brand metrics. The below infographic, developed by Marketing, sources data from Millward Brown case study analysis, PricewaterhouseCoopers’ IAB Online Advertising Expenditure Report, March 2012, analysis of MediaMind’s ad network and Mi9.